When wings are meant for swimming…. This weekend I had the gift of attending “They Gathered Around” – a retreat and explorations of those called to the work of pastoral ministry in our Meetings and wider Quaker communities. In part of this time together, we were asked to select, from a large pile, an animal that represented our gifts that we bring to our communities. A thoughtful and fun sharing of those reasons ensued. Penguins have wings. Like birds do. And yet – they do not fly. What a grand confusing mixup of expectations this is! I know a few other facts about penguins. On land, they waddle so they do not slip on the ice. They break into joyful fervor when they see someone/something they like. They embody playful exuberance. 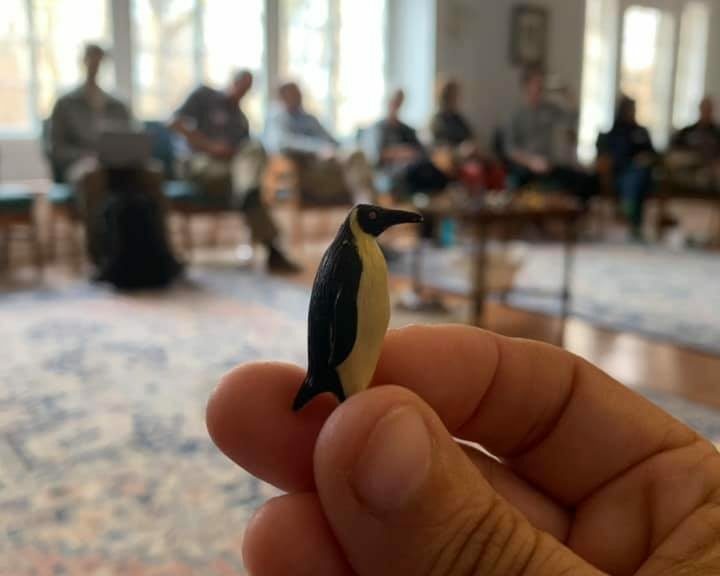 I found myself wondering during this weekend with Friends – how do our meeting communities recognize, support and honor the “penguins” in our midst? How do we create the space and flexibility for those gifts to fully emerge and be used in our communities? If it is assumed that my wings are meant for flying – and I am told that is the only option – I will always keep trying to fly. In order to please others, because it’s the way God made me, because it’s my community’s expectation. Why would it even occur to me that wings and feathers could be made for swimming? When penguins swim, they are one of the fastest animals and most effective hunters on the planet. They dive deeply, speed around catching fish, and are generally obviously made for what they are doing in that moment. With wings. In water. Hmmmmm. Penguins have another interesting aspect to their lives. Unlike other birds, which lose feathers throughout their lives and replace them as needed – penguins experience catastrophic molt. For a brief period of a few weeks, the penguins lose ALL of their feathers – turning from sleek majestic effective hunters of the sea, to comical and vulnerable awkward helpless creatures. They eat lots of fish beforehand so they don’t starve. They hang out in communities so they don’t get eaten as often. How does this relate to me (and maybe some others) in my Quaker community? 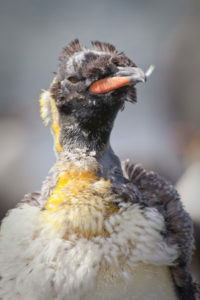 My most tender time is during the catastrophic molt. None of this gently growing back feathers after travel for me. After joyful and exhausting ministry, I’m often still riding a high of sorts from the gratitude of faithful service. I’m also totally vulnerable and featherless, and if I end up indulging in bad habits or excess of decisions, I will make bad choices and do some serious physical, mental, and spiritual damage to myself. Others might have a more gradual reentry. I need to shut down when I find myself featherless. I need Friends who can remind me about that returning and renewal as well. Those are my needs, and it’s taken me a good long while to be able to name them. I’m sure there are others I haven’t discovered yet. I can only find them in the reflections of the covenant community I walk with. 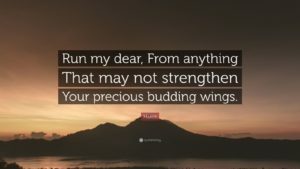 What might be some of the ways we assume Friends in our communities must always use their wings to fly, as we expect and have seen before? In order to be effective, penguins need to “flip” the bird narrative on its head. Wings are meant for swimming. Birds are in water like fish. When you see it, it all makes sense somehow. I’m holding these questions as I return from this time among Friends…. What expectations did Jesus flip? What does wholeness and resurrection and “winning”look like when defined by Love, and not by the empire? How do we encourage each other to see that kin-dom and its gifts, and fully embrace those paradoxes as the Work itself of the covenant of beloved community?